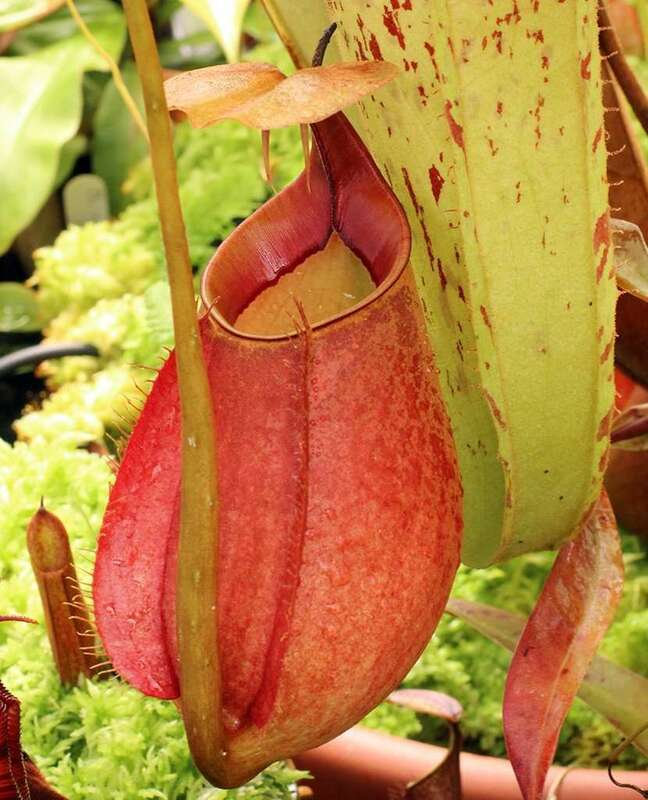 The Tropical Pitcher Plant, or Nepenthes, is a highly complex and refined bug catcher. Leaves grow out from the center of the plant, each with a thin tendril at the end and a pitcher-trap at the end of the tendril. The traps at the end of the leaf vary greatly in color, shape, and size between the many different species. Some of the traps can grow incredibly large. 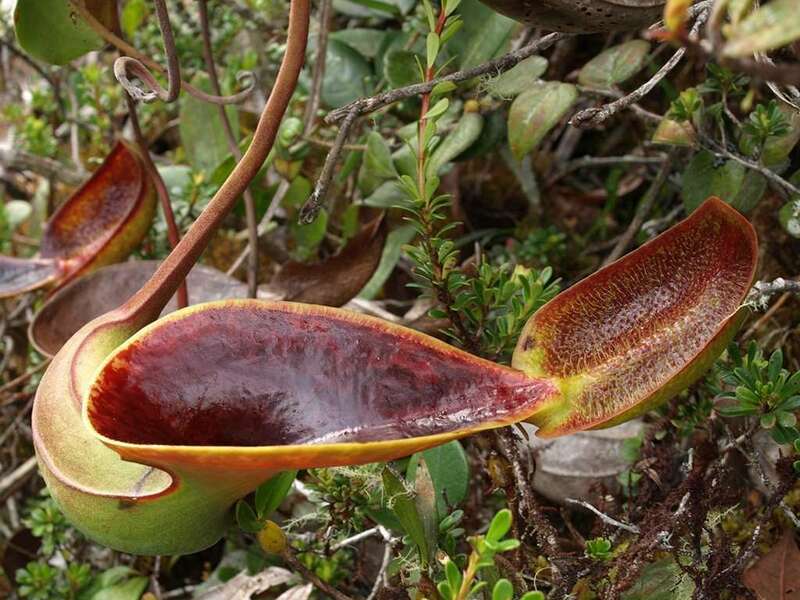 For example, the Raja Nepenthes has been known to grow immense traps in the wild, which are capable of catching small mammals—even, in very rare cases, small monkeys. Nepenthes are an extremely satisfying and exciting plant to grow. 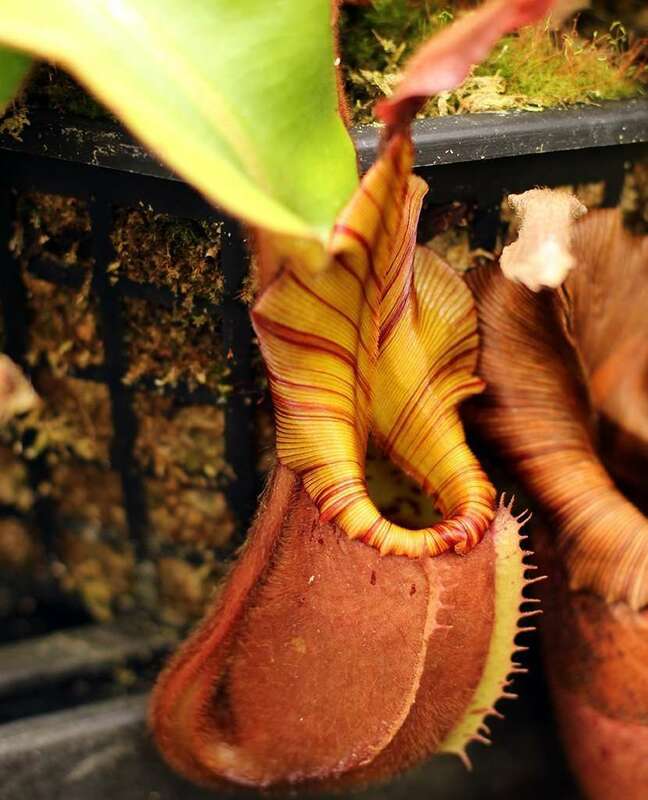 Flourishing Nepenthes will continuously produce more leaves, each with a trap at the end, and each trap possibly larger and more awe-inspiring than the one before it. You will find yourself waiting with intense anticipation as you watch each leaf develop and predict how large the new trap at the end of it will be. Petioles, or what you would commonly identify as the “leaves” of the plant unfold in a rosetted pattern from the center stem of the plant. This stem grows in height as each new lance-shaped petiole emerges. Splitting the petiole lengthwise from tip-to-tip is a midrib vein that emerges at the non-stem end as a long tendril. What is this “tendril,” you ask? Read below, to find out! You may be familiar with tendrils as your common, everyday alien appendage. Nepenthes tendrils are just as funky. Emerging from the petiole, they reach through the air looking for objects – like a tree branch – to grab onto. Once they find a hold, they wrap around the object, anchoring the plant to it. 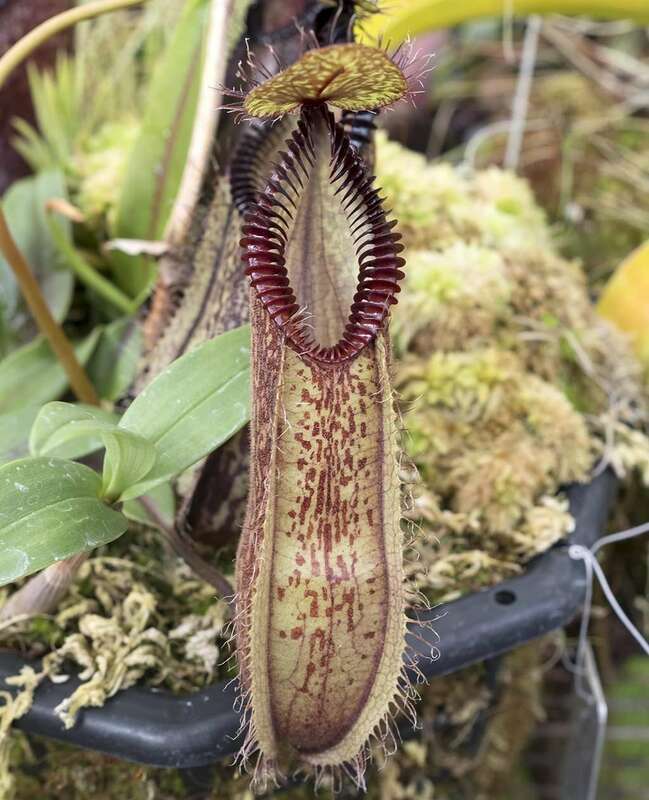 This helps the plant stay upright under the growing weight of new traps, supports the individual pitcher trap itself, and acts as a bridge for crawling insects to find their way to their digestive doom. 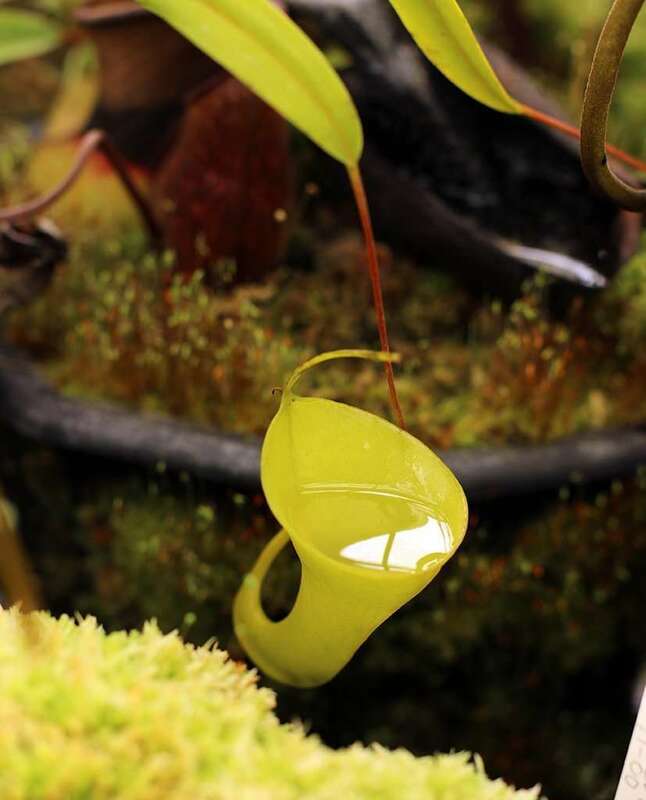 Nepenthes pitchers develop at the terminal end of the tendril. They vary in size and shape, not only across species, but even on the same plant. 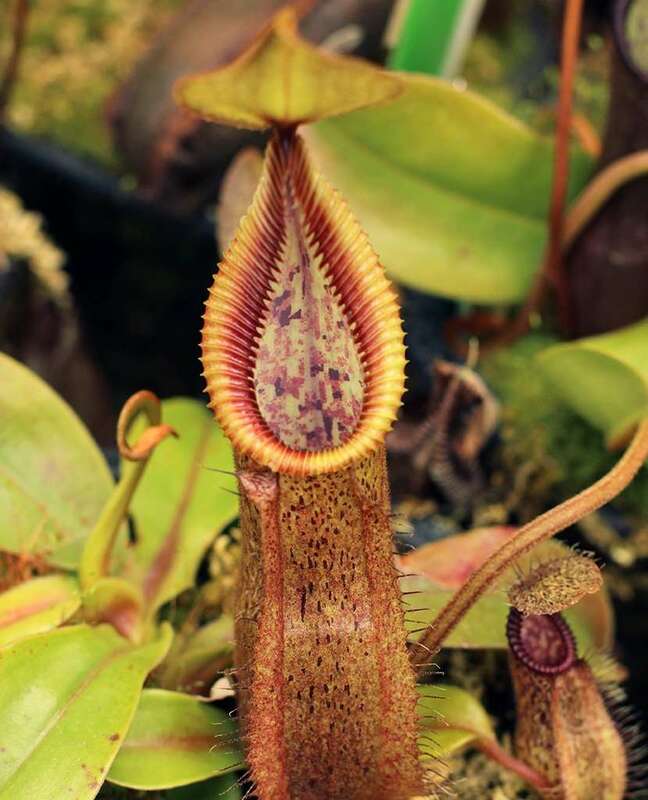 As Nepenthes stems grow taller, pitcher structure begins to morph to assist in catching a different type of insect.Lower “ground” pitchers are commonly colorful with striped or speckled patterns of reds, pinks, yellows, and greens that visually entice prey. Two wings, or “ladders” run along their front to encourage insects to climb up to the mouth. Lower pitchers are generally larger, squatter, and more colorful than upper pitchers. They will commonly rest along the ground or dangle up to a few feet in the air.Beyond this height, upper pitcher begin to form. They are smaller, more delicate, ditch the ladders, and are less colorful than ground pitchers. They’re primary prey tends to skew more towards flying insects versus crawling insects. 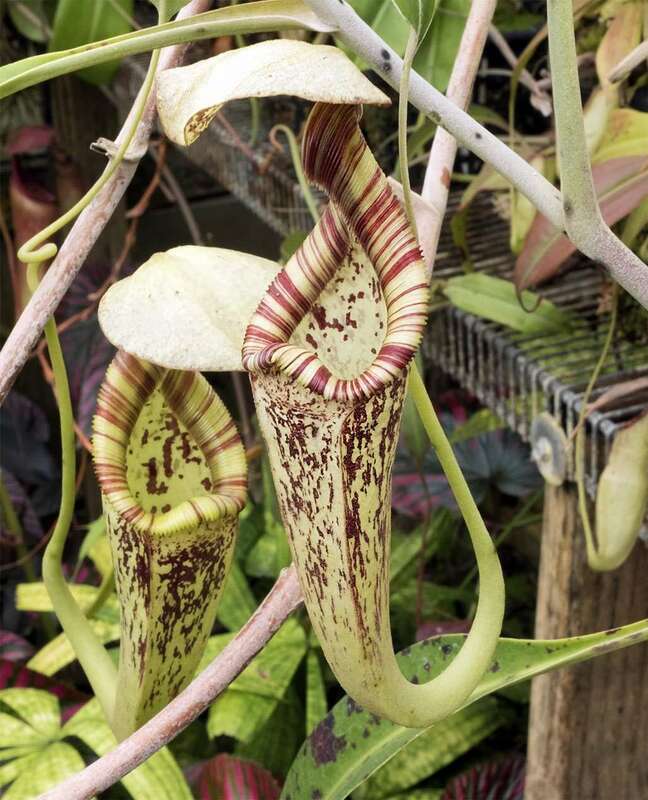 They will often look so different from lower pitchers, that you’ll assume they belong to a different species, entirely.All pitchers contain sweet nectar glands that entice insects, fatten them up, and ease them into an unsuspecting drunken stupor. These glands are most prominent along the tendril, ladders, and peristome. Pray tell, what is this peristome you speak of? Read on, below. 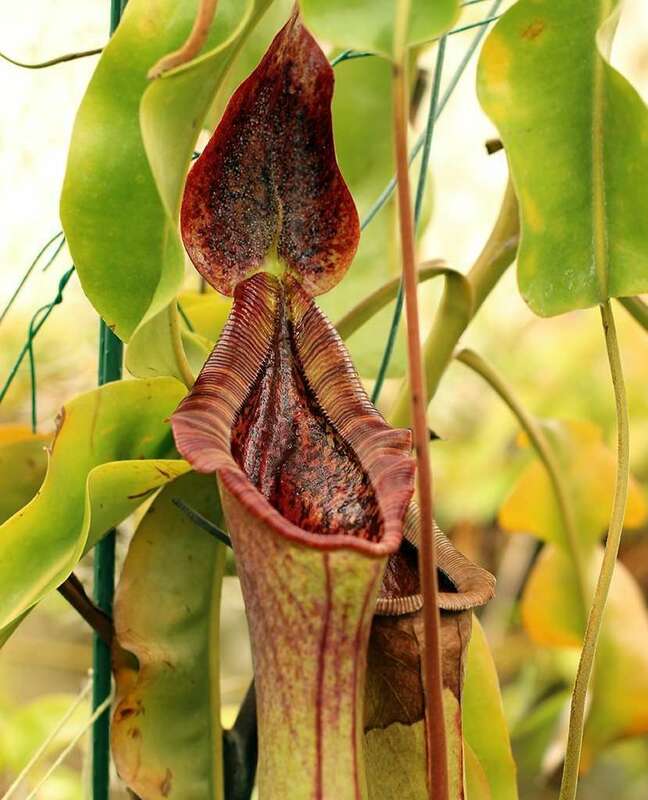 Around the mouth of a Nepenthes trap is a pronounced rim, called a peristome. This peristome often imbues each Nepenthes species with its unique personality and character. Some peristomes are grand, ruffled, and striped like candy canes in reds, yellows, and greens (Nepenthes veitchii). Others appear like twisted, hooked talons that could carve through flesh (N. hamata). Yet others develop into vampire-like fangs that drip with nectar (N. bicalcurata). Lower pitchers tend to have more pronounced peristomes than upper pitchers.All of these peristomes are deceivingly slippery – especially when wet. Bugs hiding out under the hood (read below) of the trap to avoid rain drops, often slip on the peristome and fall into the trap. The inside of the trap has two zones. The upper zone is waxy and slippery, preventing even the most sure-footed insects from climbing out and escaping. Below this is a lower zone with thousands of glands. These glands secret the digestive enzymes that drown captured prey, dissolve soft tissues, and also absorb the nutrient slurry once an insect turns into soup.Traps open with digestive fluids of a more neutral pH. As new, struggling prey is caught, it encourages the secretion of more enzymes and insect-dissolving acids. 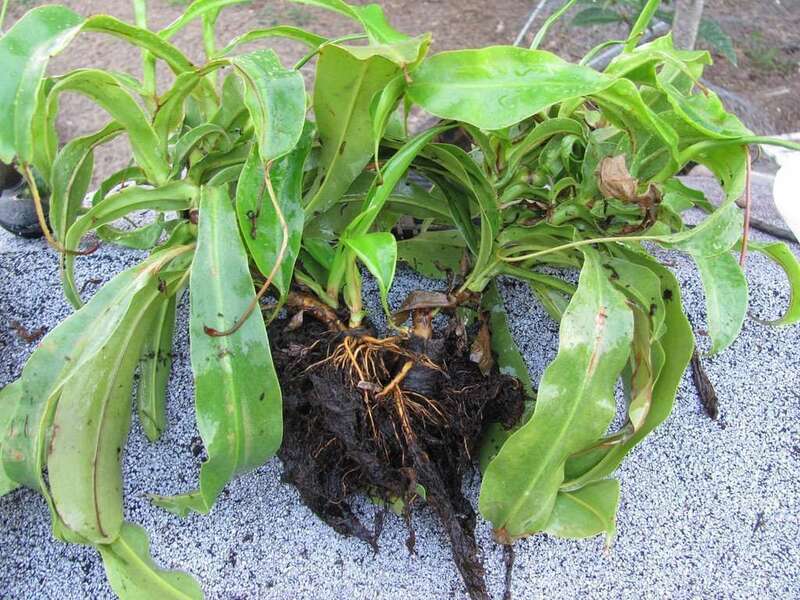 A Nepenthes root system is brittle, branching from a thicker taproot. As the plants mature, they will send up shoots with growth points independent of the parent plant. While growth may slow down during winter months, they are year-round growers with no dormancy period. High humidity and moist soils are needed for healthy growth and maximum pitcher production. 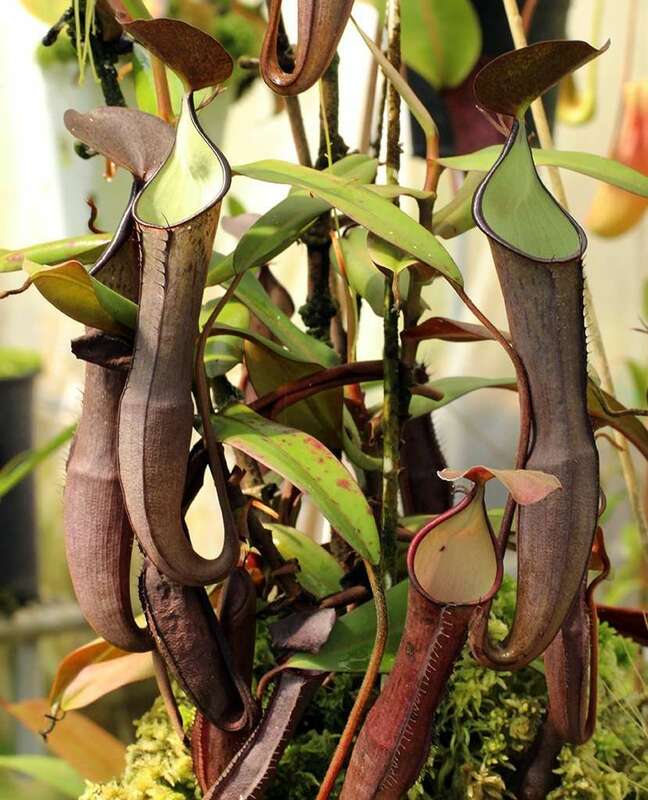 All Nepenthes grow in tropical climates, but can be divided into highland and lowland species. Below we’ll cover their unique temperature requirements. In nature, Highland species grow at an elevation between 3,000 to 10,000 feet, in mountainous regions that remain cooler and wetter than the lowland forests below. 70% of Tropical pitcher plants are highland, and they require cool nights between 50°-63° degrees Fahrenheit and days in the mid 70s°F. Frost never, or very rarely occurs, and should be avoided for healthy Nepenthes growth. 30% of Nepenthes grow in the lowland range, below a 3,000 foot elevation. Days in this zone are humid with at least 60% humidity, and hot ranging between 80°F to 90°F during the day and 60°F to 70°F at night. Colder temperatures are deadly to these plants, so keep them warm. Tropical pitcher plants are dioecious – either male or female. In nature, producing seed requires both sexes to be flowering simultaneously and cross-pollination to occur. Luckily, in cultivation, you can use some tricks to store pollen to preserve the genetics or yield the hybrids you desire. You have the option to store the male’s pollen in foil packets in your freezer for a maximum of one year. When shaken, ripe pollen from open male flowers will fall, and can either be collected for storage and later usage, or immediately dabbed up with a paintbrush and applied to a female flower. 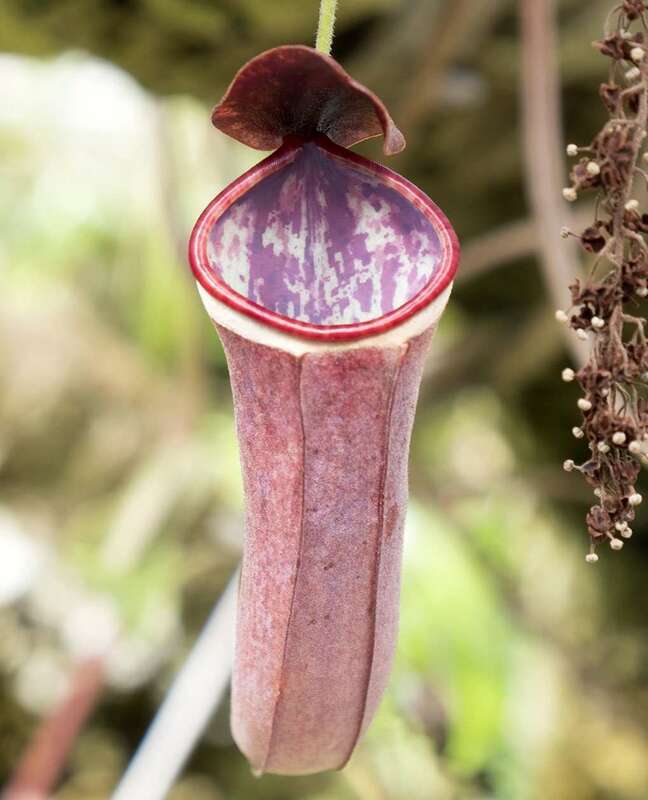 Nepenthes flower anatomy, in general, is simple – especially when you compare them to something like a Sarracenia (North American pitcher plant) flower. They even lack petals. Female flowers will have an exposed stigma, dead-center, for receiving pollen. When female flowers are in bloom, transfer pollen to the stigmas using a small paintbrush. Several flowers will be in bloom simultaneously, starting from the bottom of a flower stalk and working their way up to the tip. Repeat the pollination process a couple of times per flower to yield the best seed production. 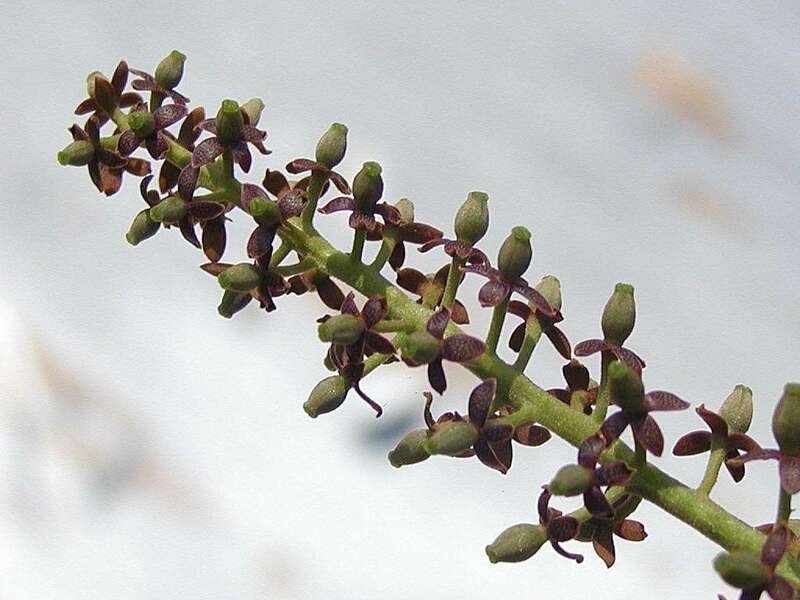 When successfully pollinated, ovaries will swell, turn brown, and crack open over the course of a few months. Nepenthes seed is only viable for a short period of time, so immediately sowing will yield best results. If you need to wait, store seed in the refrigerator for no more than 5 weeks. 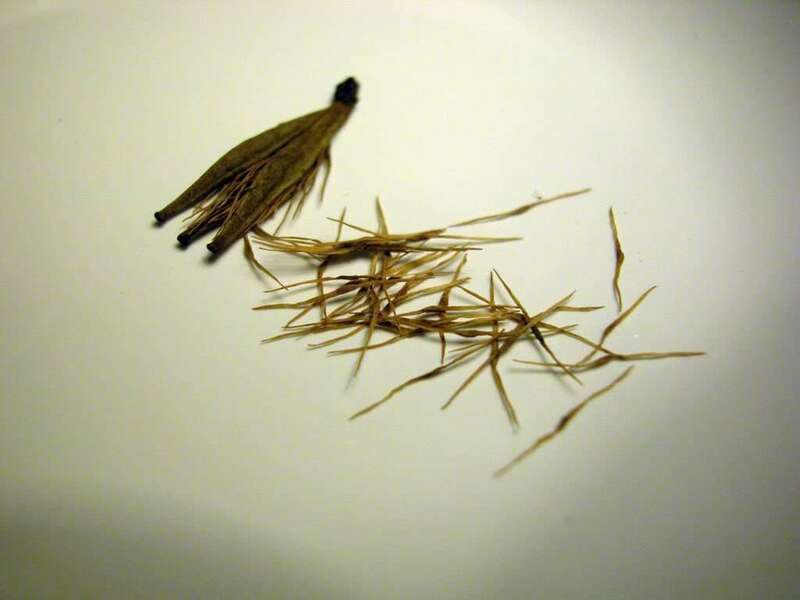 Try to avoid this with lowland species, as the cold temperatures will kill some seeds and reduce germination rates. 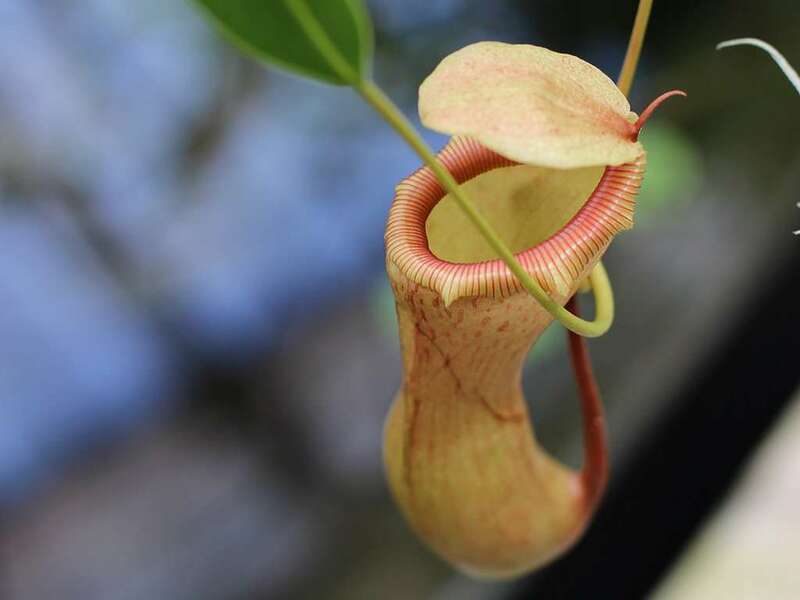 Tool to locals, curiosity to scientists, symbiotic home to unique creatures, Nepenthes are different things to different groups. 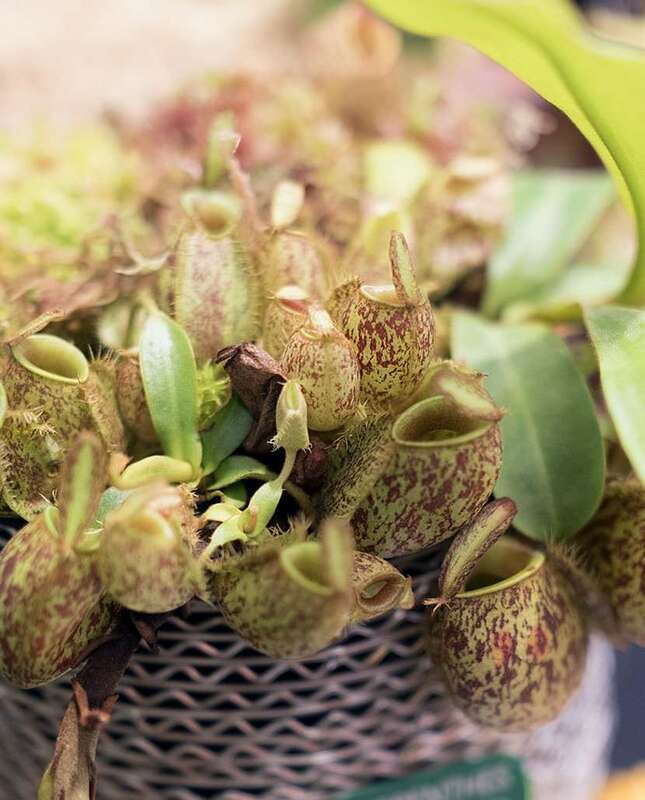 There are more than 150 critters – certain ant species, frogs, crabs, and many more – that use the Tropical pitcher plant as a home, breeding ground, or food source. 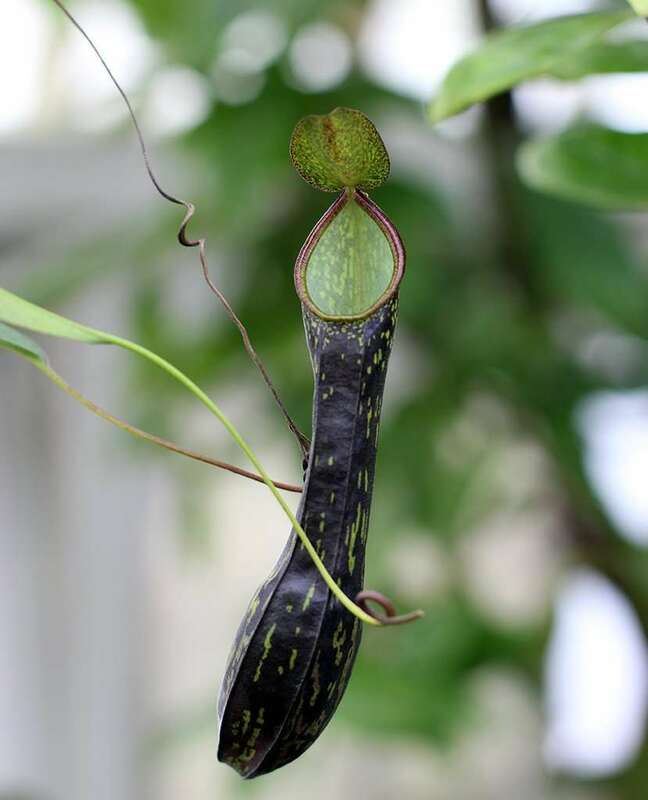 These species have evolved alongside Nepenthes to avoid being eaten, but in many cases, support a mutually-beneficial relationship with the plant. This comes in the form of droppings that feed the plant, protection from pests that would otherwise harm them, and assistance with digestion of captured prey. Locals use Nepenthes as various tools. 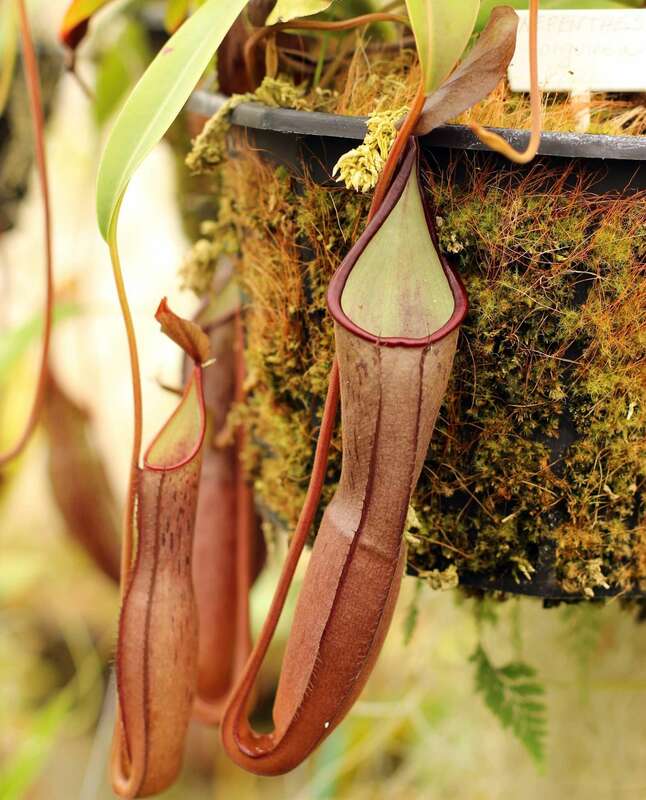 Pitchers truly live up to their name when they are used to collect rainwater for drinking or as water scopes. Some use large pitchers as cooking vessels for rice which, supposedly, enhances the flavor. Vining Nepenthes ampullaria stems have be used as rope. Unopened traps with sterile fluid inside is used as an asthma reliever, painkiller, and eyewash. Roots supposedly have medicinal qualities that help reduce fevers and regulate menstruation. Yet other parts of the plant are used to treat stomach problems, dysentery, heartburn, and indigestion. And here you thought they were only good for catching flies. 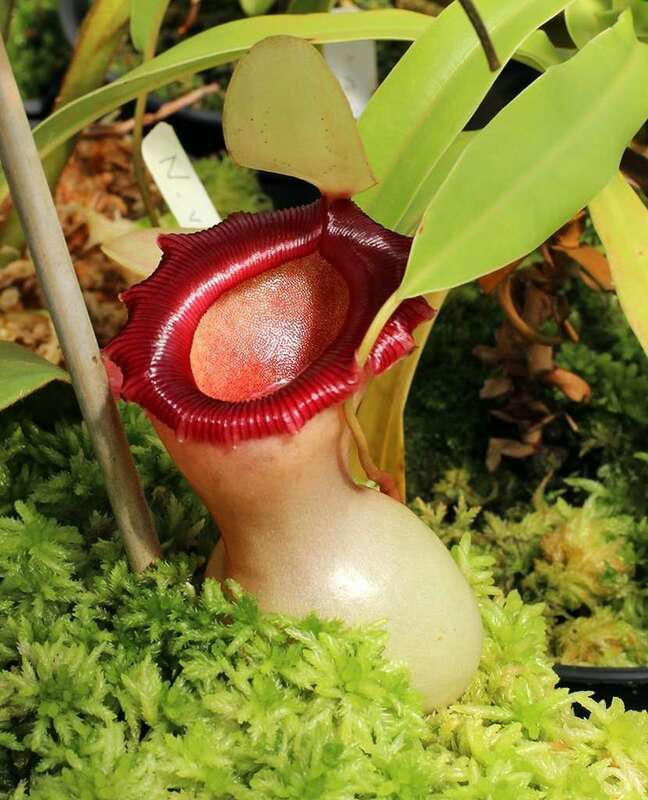 Scientists have found Nepenthes to be a fascinating and perplexing species. 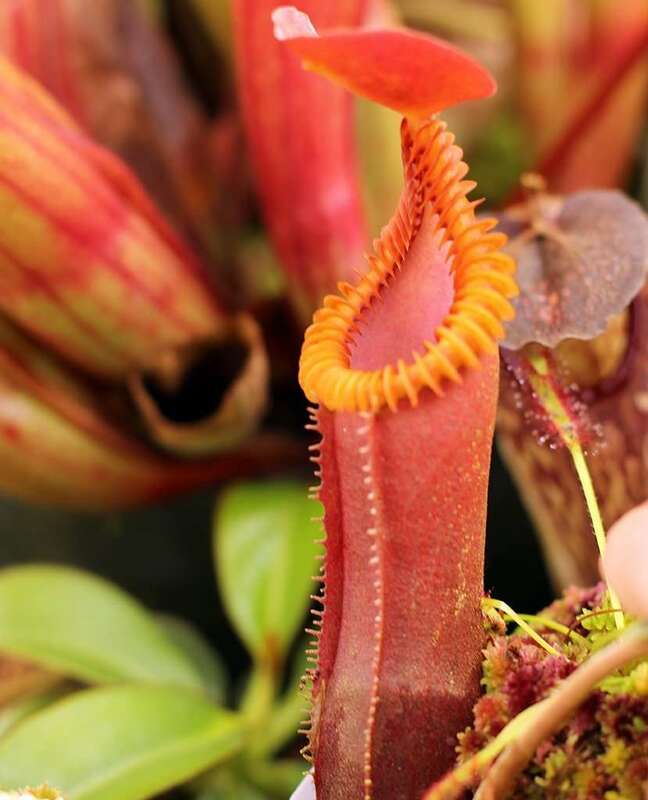 DNA links them genetically closer to sticky-leaved carnivorous plant cousins like Drosera, Triphyophyllum, and Drosophyllum, than other pitfall-trap-using carnivores like Sarracenia and Heliamphora. In Europe, fossil evidence of pollen places them as far back as the Eocene epoch more than 58million years ago. Today, the most ancient species hail from Sri Lanka, northern India, Madagascar, and the Seychelles. Once the species migrated to Southeast Asia, there was a burst in evolutionary diversity, yielding the numerous species we see today. 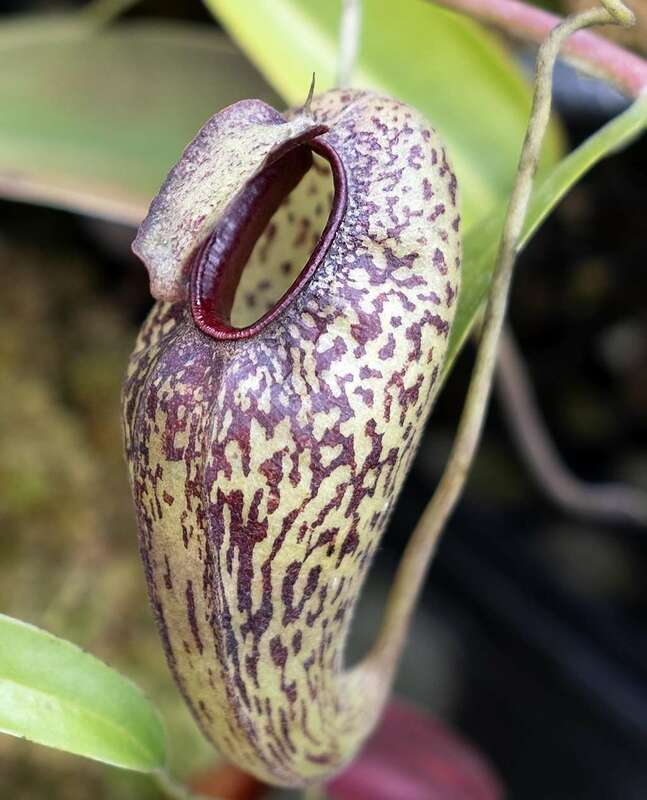 The first description of a Nepenthes (N. madagascariensis) came from Frenchman Etinne de Flacourt, then-govenor of Madagascar, in 1658; “a hollow flower or fruit resembling a small vase, with its own lid, a wonderful sight.” Carl Linnaeus enthusiastically described the second species, N. distillatoria from Sri Lanka, recalling Homer’s The Odyssey, and the drug “nepenthe” used by Helen of Troy to alleviate soldiers’ grief. 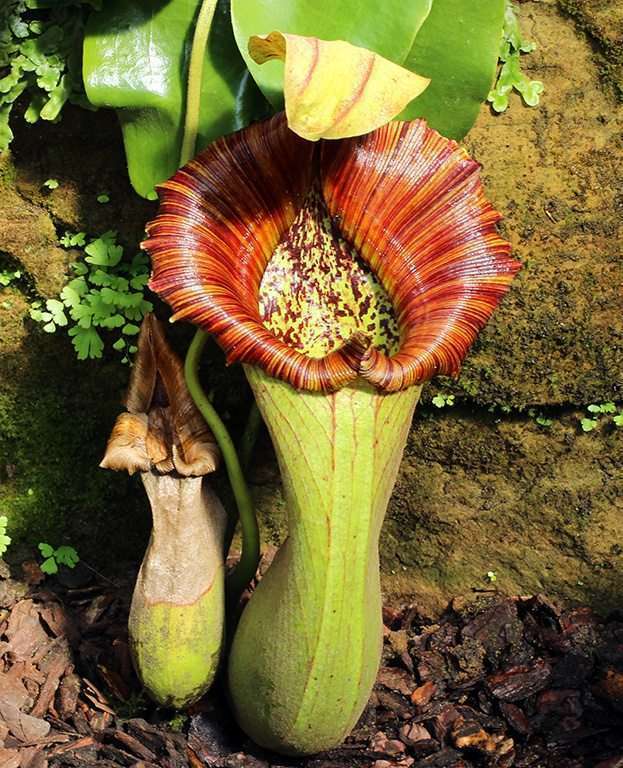 He said “If this is not Helen’s Nepenthes, it certainly will be for all botanists. 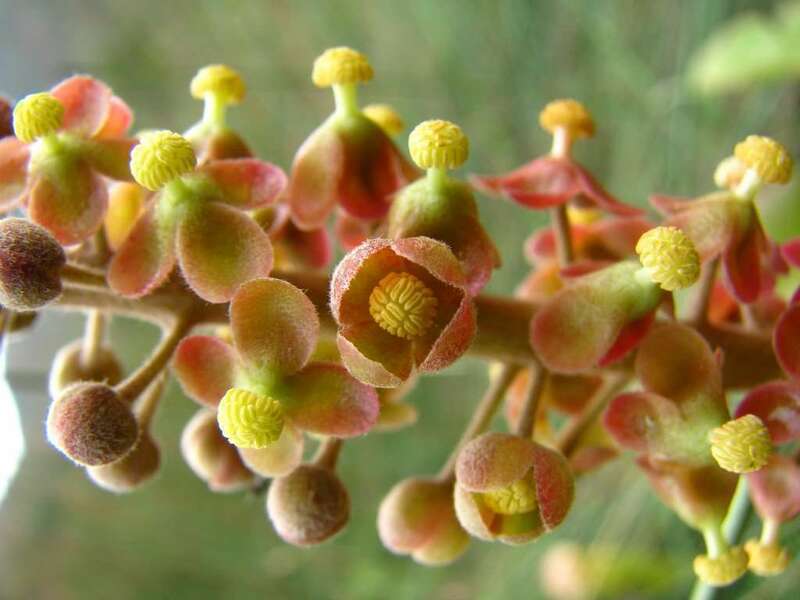 What botanist would not be filled with admiration if, after a long journey, he should find this wonderful plant. In his astonishment past ills would be forgotten when beholding this admirable work of the creator!” In 1737, it was made official, and the genus received the Latin name Nepenthiana. Nepenthes rode the coattails of European imperialism over the next century. Simultaneously, as Europeans colonized Southeast Asia, they built greenhouses to grow exotic plants for royal gardens. The Royal Botanic Gardens at Kew (a beautiful location where your dear author proposed to his wife), was one established garden, still hosting a lovely collection of Nepenthes to this day. Technological and economic advancements of the time made housing and transporting exotic plants during long sea voyages easier and more accessible to the middle class. Nurseries were established for the mass-production of ornamental plants, including Loddiges Nursery in England which introduced N. khasiana to the public in 1825. As more nurseries were established, expeditions to collect specimens became more commonplace, introducing new species into horticulture. By the 1800s, the plants were a mainstay in any serious horticulturalists’ collection. Then came the World wars and economic depression that lead to abandoned greenhouses and a decline in Nepenthes cultivation. 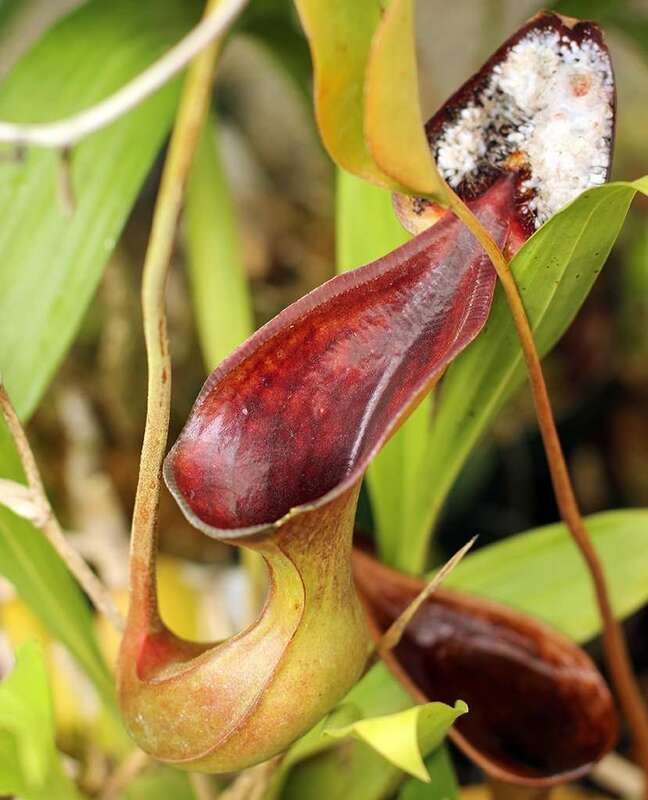 It wasn’t until the 1990s that the interests in Nepenthes reignited, with more expeditions, and more species discovered in the last few decades than any other period. We’re currently at around 150 species, and counting! 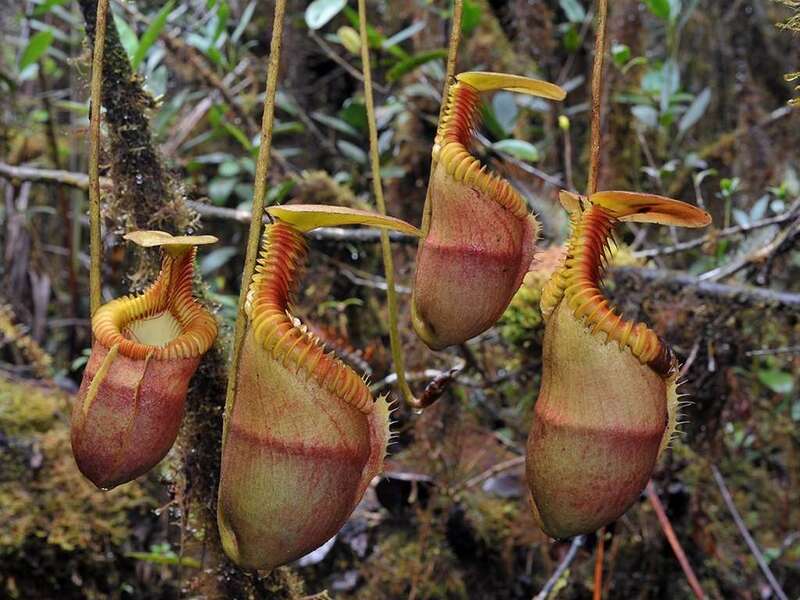 Tropical pitcher plants can be mostly found throughout Southeast Asia. Many species are endangered, critically endangered, or thought to be extinct in the wild. Make sure you’re getting your plants from a reputable greenhouse cultivator and do your part to help conservation efforts! Four-to-six inch pots are good for young plants, and six-to-ten+ inch pots will be needed for mature plants. Drainage is key. Line drainage areas with sphagnum moss to allow water escape and prevent soil loss through the holes. Use plastic pots , glazed ceramics , or wooden orchid baskets . 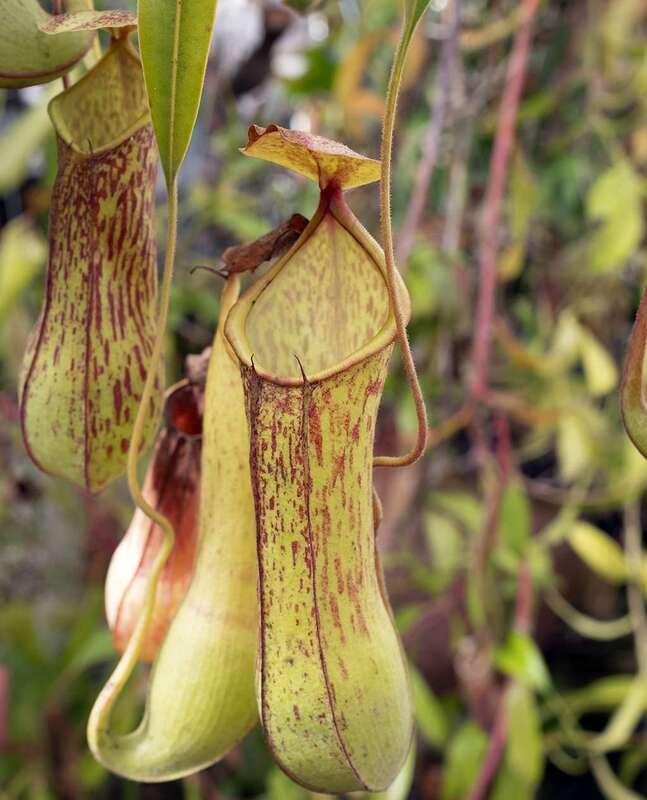 Avoid any metal zinc baskets which will poison Nepenthes. In greenhouses, daily overhead watering with no tray is best. Automated misters can be used to accomplish the same effect. Allow for drainage and avoid standing water. In windowsills or terrariums, a shallow water tray or saucer can be used to avoid sitting the plant in deeper water for extended periods. 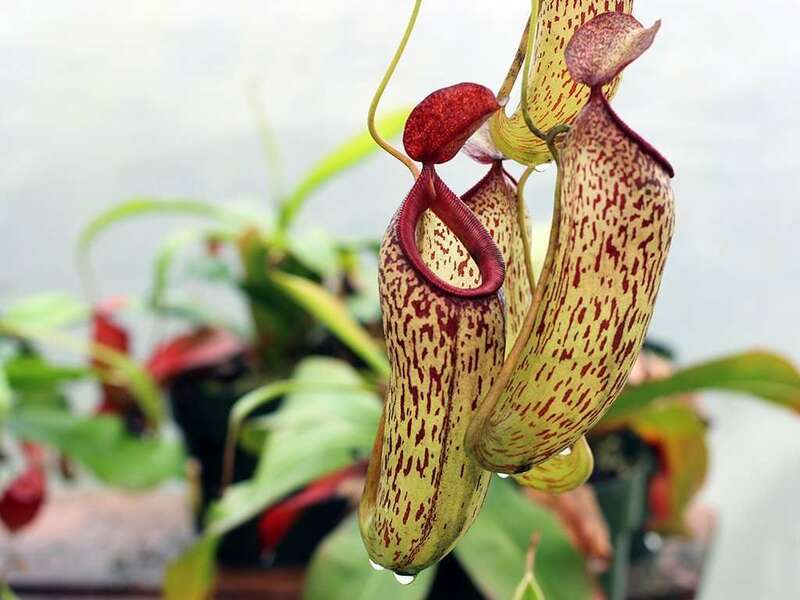 As soon as the water evaporates from the tray, water the plant.If watering is inconsistent, or the soil dries out, those big beautiful pitchers will start to dry out, shrivel, and turn brown. Bright, diffused light is best. Brighter conditions will promote deep coloration in traps, genotype-permitting. Avoid direct sun, as it will roast the plants – 50% shading in greenhouses works well. Many greenhouse-grown plants will catch ample food. Watch out, as sometimes rats and other small creatures will fall into larger traps, drown, and be digested – you’ll smell it before you see it. Terrarium-grown plants can be fed dried insects , mealworms , crickets , sow bugs – essentially anything that fits in the trap. Nepenthes enjoy a light foliar fertilizing once-or-twice a month. Dilute the fertilizer with water to about 1/3 strength. 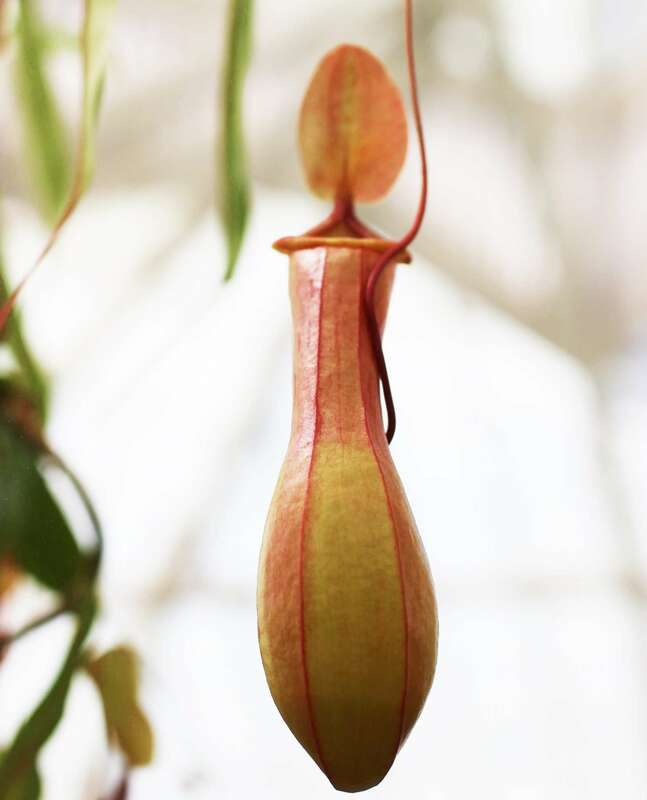 Avoid using Miracid as it can harm Nepenthes. Many species of Nepenthes will develop basal shoots, emerging from the soil just adjacent to the main plant. I don’t recommend attempting to divide these as they tend to share a root system with the main plant. 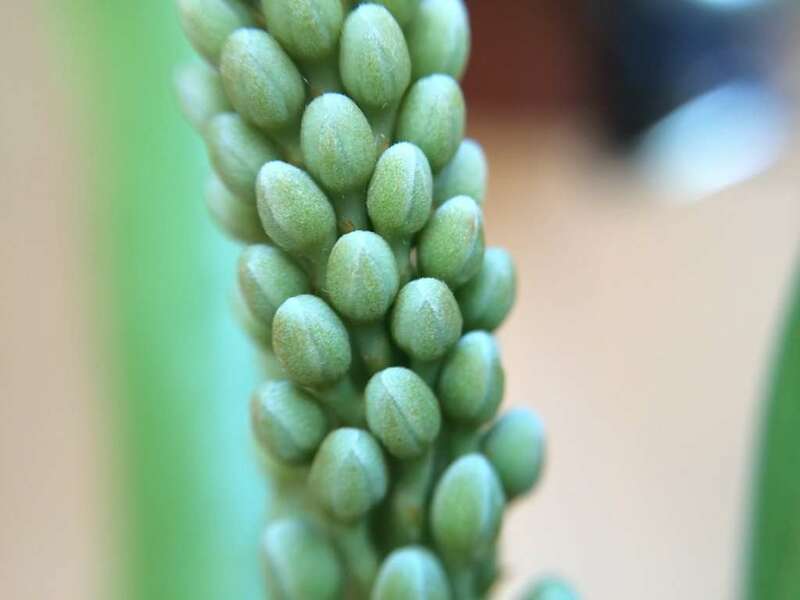 Separating them is not impossible, but it will shock the plants, and can lead to stunted growth or death.A much better approach is to use these basal shoots as an opportunity to take cuttings from the main plant. See the section below for details on how to take Nepenthes cuttings and note that, even if you have terrible luck and your cuttings don’t root up, your main plant will continue to thrive via the newly sprouted shoots. Seed is only viable for a few weeks, so we recommend sowing it as soon as possible. If you need to store seed for about a month, place it in the refrigerator in a jewelers bag or small envelope. Do note that the cold temperatures can kill some lowland seeds.Sow Nepenthes seed sparsely in milled sphagnum moss, keep moist, and maintain high humidity. Using a seed tray works best. Mimic climactic conditions that the parent plants prefer. After seed has sprouted, you can remove the humidity dome and allow them to grow for six months to one year. 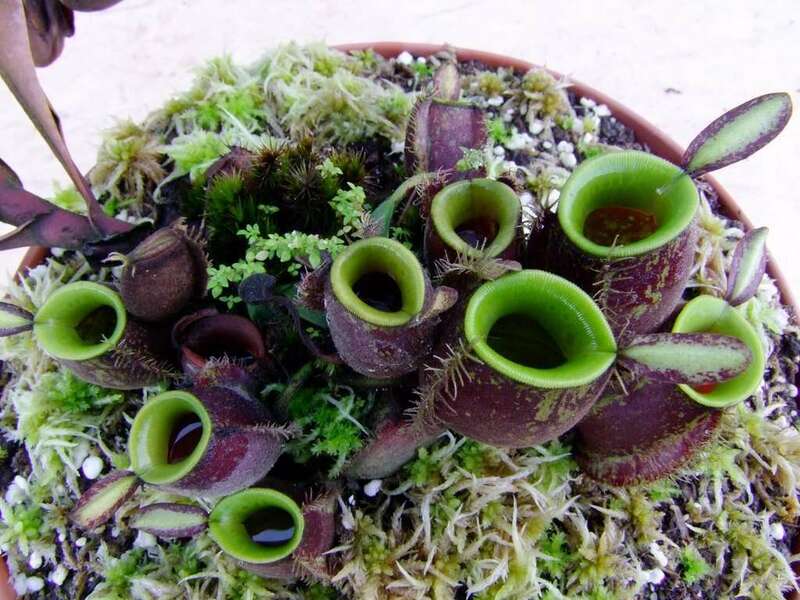 They will form adorable little rosettes with itty bitty pitchers.After this time, you can transfer them to small pots of their preferred soil mixture. Foliar fertilizing should be with a very diluted solution only once a month until the plants are at least one year old. 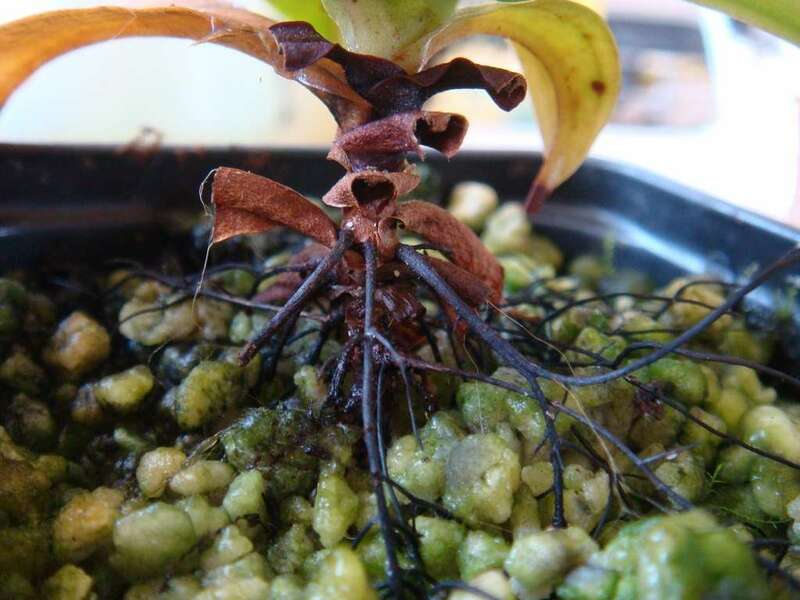 Nepenthes can be propagated in vitro via seed. 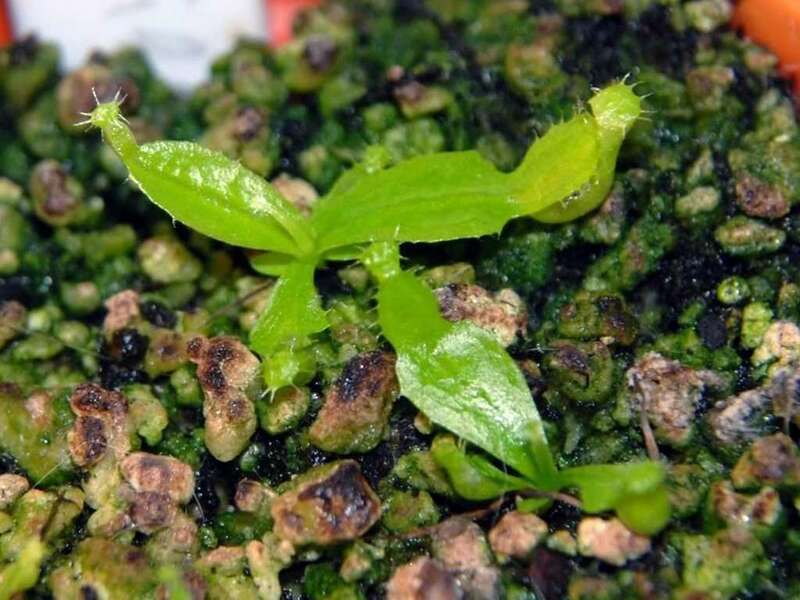 In recent years, tissue culture propagation has helped once-rare species become more common, assuring their survival, and making them more accessible to hobbyist growers. Scale, mealybugs, and thrips are the most common pests to attack Tropical pitcher plants. Use a systemic pesticide , and consider using a flea collar inside terrariums.If you notice rust spots on petiole leaves, it’s most likely a fungus that can be easily treated with common fungicides. 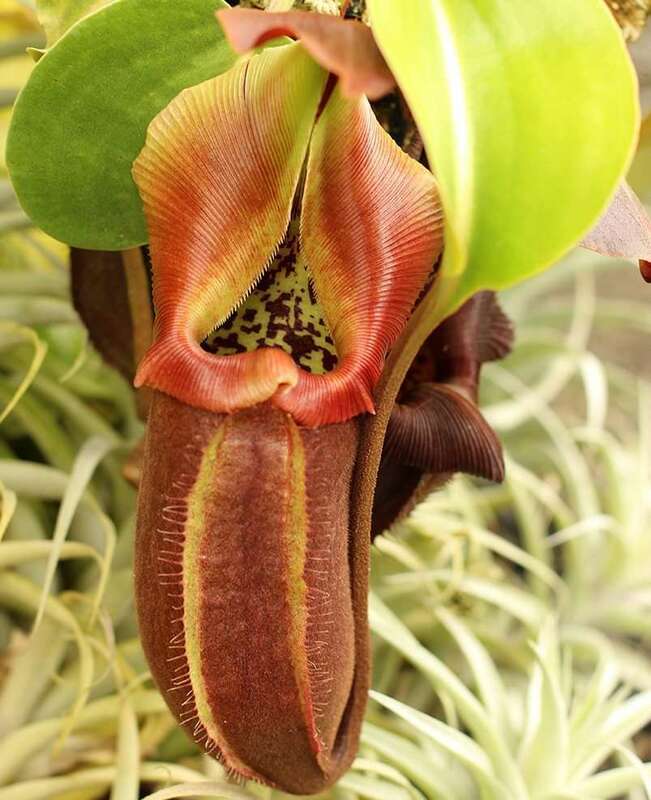 As mentioned above, Nepenthes can be divided into lowland and highland species. All require high humidity above 60%.Lowland require hotter temperatures with daytime temps between 80°F and 90°F and nighttime temps between 60°F and 70°F.Highland species require lower temperatures with daytime temps between 70°F and 80°F and nighttime temps between 50°F and 60°F. Dips into the 40°sF are occasionally tolerable, but frosts should be avoided. The plants will do well outdoors if you can mimic their natural climates and avoid frosts. Tropical climates work best, and the plants love to climb trellises. Lowland species can do well in places like southern Florida. Highlanders can do well along frost-free California coasts. Avoid extended periods of hot temperatures with low humidity. The absolute best place to grow your Nepenthes! Some highland plants and lowland plants can be grown together without too much fuss between temperatures of 60°F to 85°F. Many highlanders can tolerate hothouse conditions but watch out for lowlanders as they won’t do great at ideally cooler highland temperatures. Lowland/highland hybrids will be the most robust and preform well in these conditions. Another great place for Nepenthes growing – just make sure you have enough space in a larger terrarium and you choose smaller species. Lowlanders may require heating pads, and highlanders may require refreezable ice packs to bring temperatures inline with ideal growing conditions. Plants like Nepenthes ventricosa and some hybrids do well in brightly-lit, humid windowsills. If plants are not pitchering, its likely due to lower humidity. Misting the plants regularly can help. Probably not. Stick to terrariums, windowsills, and greenhouses. 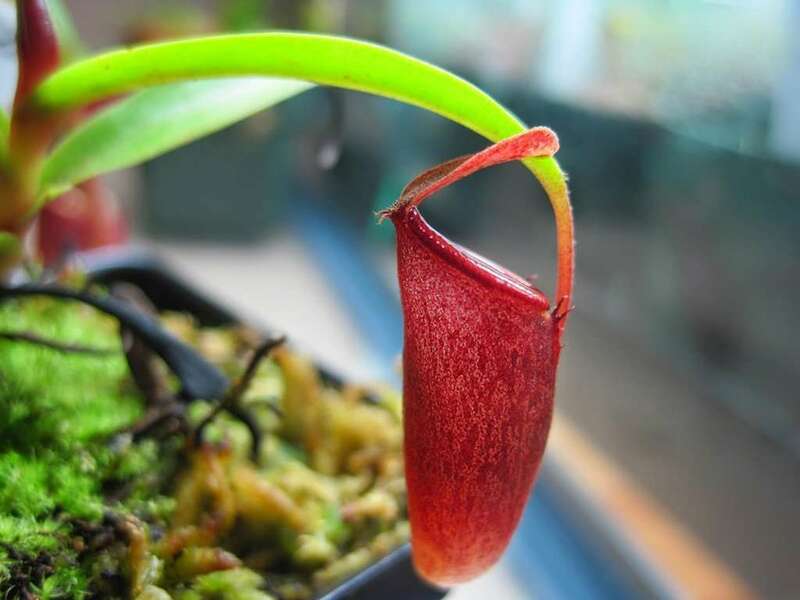 Nepenthes ventricosa is a variable species, easy to grow in a windowsill or terrarium, and an ideal beginner's Nepenthes.